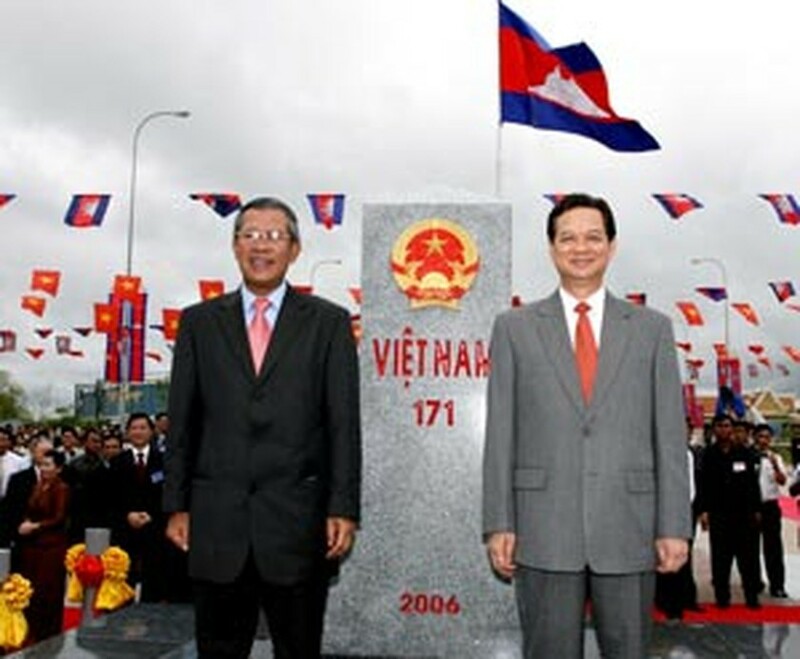 Vietnamese PM Nguyen Tan Dung (R) and Cambodian PM Hun Sen (L) stand next to the first Border Marker during the inauguration ceremony at the border gate between Moc Bai, Vietnamese Tay Ninh Province and the Bavet commune in Chantrea district, Cambodian Svay Rieng Province, Sep. 27, 2006. Viet Nam and Cambodia on Wednesday officially began demarcating border between two countries. Vietnamese Prime Minister Nguyen Tan Dung and his Cambodian counterpart Hun Sen placed a symbolic first border marker at the Bavet-Moc Bai crossing, some 150 kilometers (90 miles) southeast of Phnom Penh. Vietnamese Prime Minister Nguyen Tan Dung hailed it as a "victory of the two countries' people." Mr. Hun Sen said during the ceremony "We have a clear aim to make the border areas not only free of disputes, but also to make the border areas places of development where people can live with prosperity". 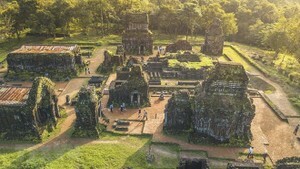 The two nations signed a deal in last October in Hanoi to set out the boundary. Their border is essentially unmarked because the boundary left over from French colonial times is vague, with stone markers and boundary flags having disappeared, while trees lining it were cut down. The treaty signed last year created a joint commission that will plant border markers at this and six other checkpoints by the end of 2006. The planting of some 353 markers along the 1,270-kilometer (787-mile) border is due to finish by the end of 2008.